A Master-Class Amulet, and an Immensely rare acquisition, which has disappeared in the very few years since the discovery of this Sacred Pra Kru hiding place amulet, so famously and universally confirmed to have been blessed by the great Luang Phu Sukh, of Wat Pak Klong Makham Tao, and Luang Por Parn, of Wat Bang Nom Kho, in Ayuttaya. The Pra Somdej Rasamee Nuea Pong Bai Lan (black color burned Parchment Grimoire Soot), was made around the year 2460 BE, and was blessed by the two great Masters of Olden days. who ordered them to be hidden in the Wat Klong Khom Kru Burial Chamber of the Chedi Stupa, where they remained until their recent discovery some years ago. The Pra Somdej Rasamee was made in Granular Pong Bai Lan (black color), and Creamy Pong Puttakun (white color). There are also a very few rare examples where the Pong Puttakun turned a shade of pink, which are the most highly preferred of all. Taken from the Kru Klong Khom Chedi Stupa hiding place chamber at the temple of Wat Klong Khom in Chainat. This amulet was quickly confirmed after its discovery to have been blessed and empowered by the Great Master Luang Phu Sukh ( Wat Pak Klong Makham Tao), and the Legendary Luang Por Parn (Wat Bang Nom Kho). This amulet is officially recognized in the collector and antique marketplaces. The amulets were made in three different substances,; Nuea Pong Bai Lan, Nuea Pong Puttakun, and Nuea Awk Chompoo Gae Sabu Luead. This amulet has already seen a few attempts to make fake copies, which have all failed till now because they do not look anything like the original. Their cement is nowhere near as hard or dry as the real thing. The authentic amulets, have a smooth but grainy stony feel to them, are extremely hard and dried (due to many years ageing), and have very strong 'Kraap' marks (earth and stains from being buried in the Kru for decades or centuries), which are not able to be removed with a scratch of the fingernail (this is the case often with fakes, for the Kraap hasn't had enough time to dry. You can use this technique to test amulets you suspect to be not as old as they claim to be). Luang Phu Sukh is one of the greatest Magic Monks of all Thai History, for which reason this is an amulet more to keep and Bucha than anything else, although it is also a good investment as the price will become ever more expensive. This is already an extremely rare and hard to find amulet. A most sacred and desirable addition to anyones collection indeed. 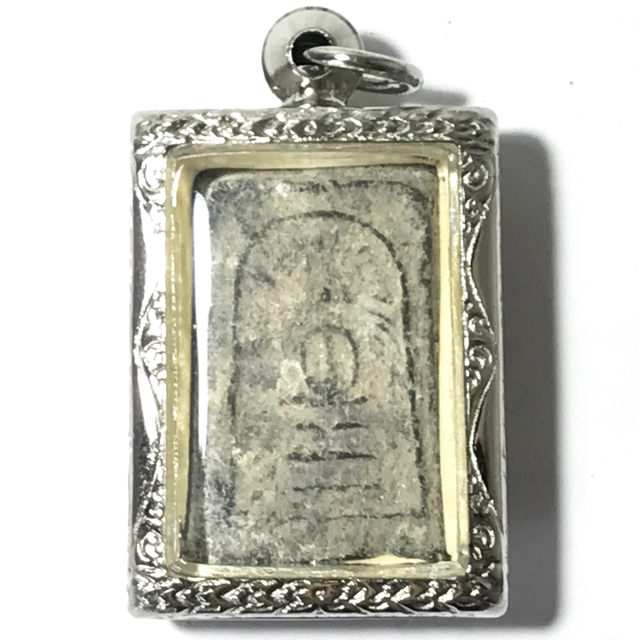 Few amulets at this price can compare considering the sacredness, the maker and the beauty and age of this amazing amulet. This amulet was also blessed with Luang Por Parn (Wat Bang Nom Kho) as well as LP Sukh of Wat Pak Klong Makam Tao - These are two of Thailands greatest ever Guru Monks and Magic makers, whose amulets are of the hardest to find, the most replicated, and high p[riced on the collectors market. 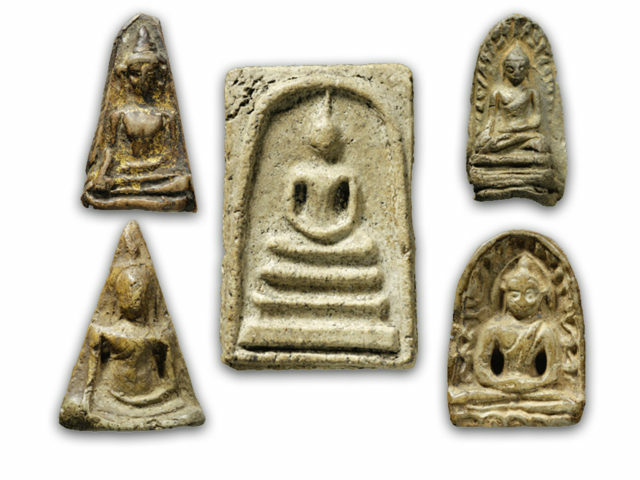 These Kru Klong Khom amulets are thus (because of their still affordable price) a wonderful option for devotees of Luang Por Parn or Luang Phu Sukh to obtain an authentic Centenarian amulet blessed by two of the Greatest and most Legendary Master Monks in the History of Thai Buddhism, and of Thai Amulets and Wicha Akom (Buddha Magic). It is 'Kanaen' size (small size) makes this ancient and sacred amulet highly apt for men, women or even children to wear, as an auspicious protector and bringer of good fortunes, and a powerful amulet for Buddhanussati (Mindfulness of the Buddha, his teachings, and One's Own Practice, and Moral Precepts. 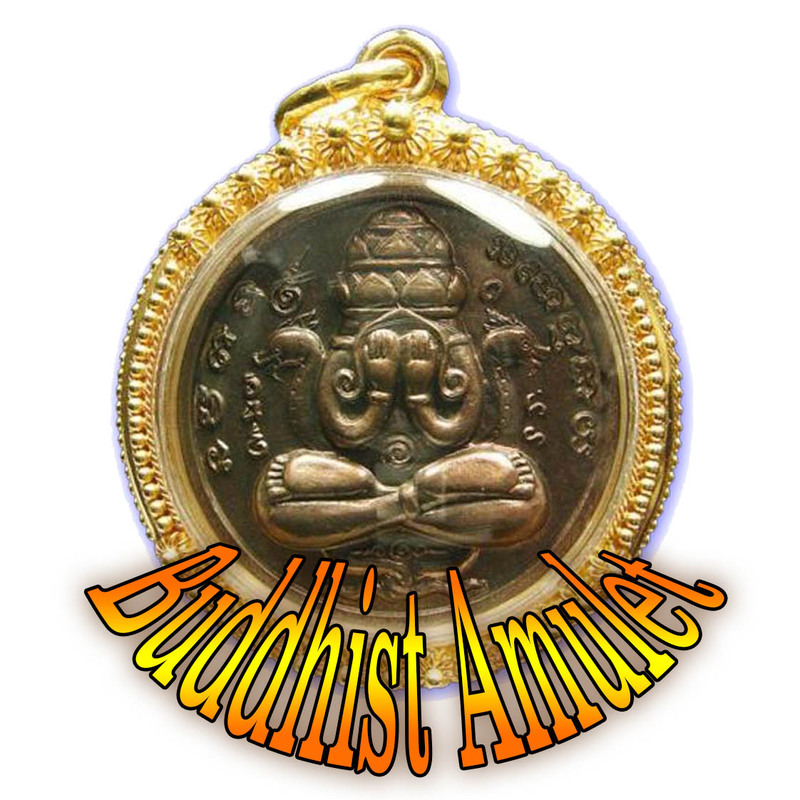 The amulet has power of Kong Grapan, Metta, Serm Duang, Klae Klaad, Gae Aathan and is also Puttanussadti for the faithful followers of the Buddha. The Bai Lan version is more attractive for soldiers, policemen, bodyguards and people in dangerous professions. The white Pong Puttakun ones are stronger in Metta Mahaniyom and good for merchants and people in social, Public and artistic professions. Luang Phu Sukh, who was so famous for his Magical Powers and Miraculous Feats, which included having been seen to blow into Tamarind tree leaves and transform them into Bees, or turn Banana Flowers into live Rabbits. Luang Phu Sukh was the Kroo Ba Ajarn of his Lordly Highness, Admiral Grom Luang Chumporn, who was an apprentice to Luang Phu Sukh in Sorcery, and one of his greatest Devotees. Below; One of many News articles about the Sacred Pra Kru Klong Khom hiding place amulet find, and the confirmation of them being made and blessed by Luang Phu Sukh, and by Luang Por Parn. Luang Phu Sukh had many Wicha such as the Wicha Suea Saming, able to transform into a Tiger, and the Wicha Look Pern Sakot, which was to perform incantations into a bullet of a single shot firing gun, and the bullet would always find its mark on target, without fail. One could say that Luang Phu Suk is one of the greatest masters of the History of Thai Guru Monks, and is one of the top Ten Legendary Monks of all time. There are so any legends told about his miraculous powers and feats. His Mastery of Traditional healing and herbal Medicine has led his written works on the subject to become the greatest Thai Occult herbalism Recipe Grimoire in all existence. He was the Kroo Ba Ajarn of a great number of the most powerful Master Monks of the last Century, and his powerful Magic remains second to no other Guru Monk in Thai History. It is said that Luang Phu Sukh became the Kroo Ba Ajarn of Grom Luang Chumpor, a Royal Courtier, an Admiral, and a Great Sorceror of his time. This happened as Grom Luang Chumporn's navy boat had broken and he was forced to park the bloat close to Wat Pak Klong Makham Tao. Grom Luang went to make reverence to Luang Phu Sukh, by pretending that he was just a simple commoner, and not a member of the Lordly Family, but Luang Phu Sukh addressed him by his name, surprising Grom Luang Chumporn. Grom Luang went to make reverence to Luang Phu Sukh, by pretending that he was just a simple commoner, and not a member of the Lordly Family, but Luang Phu Sukh addressed him by his name, surprising Grom Luang Chumporn. Grom Luang Chumporn asked Luang Phu Sukh how he knew who he was? Luang Phu Sukh told him that he saw his Aura approaching, and that it was brighter than that of the normal commoners, and that it told him already who he was. Grom Luang Chumporn asked to learn Wicha with Luang Phu Sukh, and was bestowed with many Magical Wicha, such as the ability to remain under the water for hours and breathe as if he was on land.